The Game Of Air-Sea Rescue. Produced during the war under a royalty arrangement with the Royal Air Force Benevolent Fund by Raphael Tuck & Sons Ltd. 'A thrilling game based on the splendid work of the Air-Sea Rescue Service in searching for and picking up gallant airmen who have force landed in the sea'. 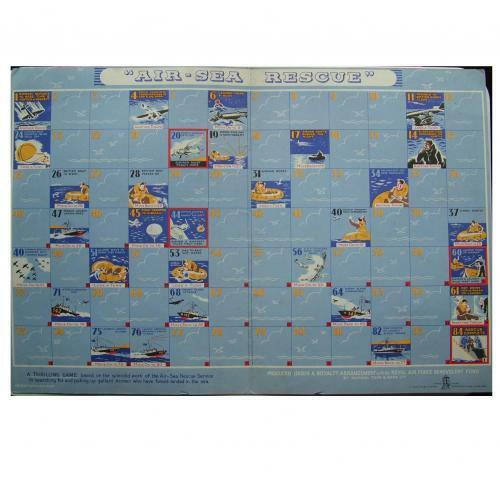 The colourful playing board is printed on thin war economy card and opens to approximately 50 x 34cm (20 x 13"). The board shows various scenes related to ASR and the game plays in a 'snakes and ladders' way where you move forward spaces when good luck prevails, such as remembering your whistle, rations kept dry etc, and back when there is bad luck such as forgetting your skull cap, having to bale out water etc. The board is grubby and stained externally - far more to the front cover than on the rear and there appears to have been some water damage that has lifted/separated the paper at the edge (see photograph 11). However, the playing side is really quite good, undamaged, clean and with bright vibrant colour. No instructions of playing pieces but they were very basic. Stock code M21270.